Understanding how our ten number system works enables students to see interesting and useful patterns and relationships in these math activities. These patterns allow students to develop more efficient mental math strategies when multiplying by multiples of 10 or 100. Students will also review rounding and apply this skill to larger numbers - up to 100,000’s place. Understanding our base-ten number system is the foundation for many skills to come. 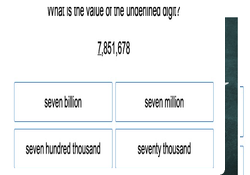 In this unit, students will add on to their understanding of place value and extend to the millions! They will also learn how to read, write and order larger numbers, in addition to decimals to the tenths and hundredths.